I have talked before about how much fun it is to share interests you had as a kid with your kids. With this product I got to experience enjoying something that my parents enjoyed when they were growing up. Atari debuted in 1972 and continued to make games until 1984. 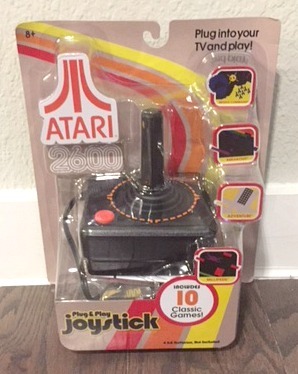 Now you can enjoy 10 of their games with the Atari Plug and Play Joystick! This is the Atari Plug and Play Joystick. Neither my husband or I had ever played the games available on this game device before. It was fun experiencing a new way of playing games, since we do love games. But we learned that playing games from before we were born is hard. We do understand that these games are from a different time of video games so it was fun to see how far they have come compared to the XBOX One games we are currently used to playing. The Joystick is easy to install. 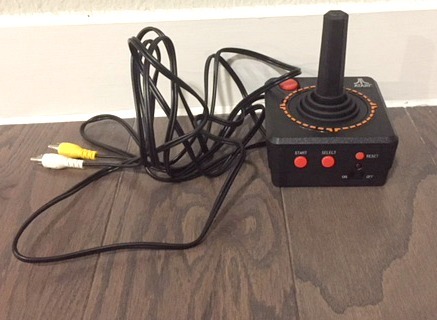 Attached to the Atari Plug and Play is cords that plug right into your television. The only other thing you need to get setup to play is 4 AA batteries. Something you want to make sure to do is turn off the joystick after you are done using it or your batteries will die fast. 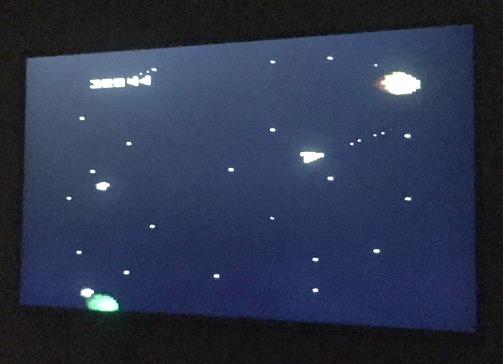 On the Atari Plug and Play you can play 10 of their games. The age recommendation for this product is 8 and up. Sometimes I am able to see that an age recommendation can be adjusted but for this it is set to a good age. Even for myself the games were hard to play. I highly recommend this product as a gift this Christmas for anyone who grew up playing these games. Or for a child of someone who grew up playing these games. Another great thing about this product is that it is only $19.99! That is a great price for a product that will bring hours of fun for the whole family! If you grew up playing these games which would you be most excited to play today? Let us know in the comments.